The argument of this research paper is that the current policies in place for displaced children are based on assumed vulnerabilities and do not include children’s perspectives or actions; as a consequence, they are not recognising and addressing some of the challenges displaced children face. Despite the strong attention prescribed by the government towards the displaced population, displaced children can actually become invisible within the school because student peers give a negative connotation to being IDP and displaced children react by staying anonymous about their status. National policies consider neither the negative connotation of being an IDP at school nor the reaction of displaced children. This points to the fact that the government cannot recognise this situation of invisibility and reach many of the displaced children at school. 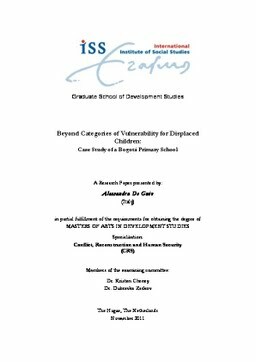 Moreover, the Ministry of Education conceptualised vulnerability as exclusion from the education system, and all its efforts are aimed at increasing access to education, leaving little or no consideration to displaced children’s perceptions of vulnerability, namely insecurity and the limitations it causes. If the government is trying to identify and reach displaced children with its support and services, it needs to go beyond its categories of vulnerability and investigate the experiences of displaced children.